Malcolm Turnbull says the new Badgerys Creek airport planned for Sydney won’t work in the longer term unless it has rail links. The federal Coalition government under Tony Abbott gave no commitment for rail links for the project, but his successor indicated on Friday a change might be on the cards. The Abbott government said last year it would spend $3.5bn to fund roads around the new airport. In August, the deputy secretary at the Department of Infrastructure and Regional Development, Andrew Wilson, said the airport would have no rail links when it opened, a statement greeted with incredulity by airline executives. OPTION plans for major new rail links between Western Sydney, the CBD and the second airport at Badgerys Creek will be launched today by the federal and state governments. Train links to the planned new airport at Badgerys Creek will be the focus of a scoping study into transport projects in western Sydney. The study, which was jointly announced by the Federal and New South Wales Governments, will cost $2 million and take one year to complete. But it will not fast-track the delivery of a rail line to Badgerys Creek airport, with the Deputy Prime Minister Warren Truss maintaining there is no need for a rail line when the airport first opens to passengers in 2025. "We don't want to have a rail line that is not used and therefore is a liability to taxpayers on an ongoing basis," Mr Truss said. "The timing needs to be right." He said the Sydney and Brisbane airports were the only two in Australia that were connected by rail. "The reality is Melbourne, Perth, Adelaide and certainly airports the size that Badgerys Creek will be when it opens, don't have rail networks. They're exclusively serviced by road," Mr Truss said. He said the Government envisaged eventually building a rail network that would include a stop at the future airport and connect growing residential suburbs in the area. The airport would be built "rail ready" with space for a station and tunnels excavated, Mr Truss said. The Shadow Minister for Transport and Infrastructure, Anthony Albanese, slammed the Federal Government's approach to the project. "It needs a rail line to be open on day one," Mr Albanese said. "This needs to be a visionary project, it needs to be more than just a runway and an airport terminal. "It needs to be a driver of the economy and jobs for western Sydney and part of that is the benefit that will come from rail." The Tourism and Transport Forum welcomed the move to carry out the study and described it as a "change of heart" by the Federal Government. TTF's CEO Margy Osmond said both the State and Federal Governments should also examine options for high speed rail to and from the airport. "The international research indicates that travellers place a premium on being able to access their intended destination within 30 to 45 minutes of leaving an airport," she said. "High speed rail is the best candidate to linking the Sydney CBD and the new airport within that time frame." Western Sydney councils have slammed a federal government report into the proposed multi-billion dollar airport at Badgerys Creek as a "rush job" that is "full of holes". Of course they do, ADL is only 8km from the city and it's on a major PT corridor regardless of the presence of the airport. Badgerys is a different kettle of fish. It shouldn't be too expensive to extend rail, greenfield, into the Airport. Leppington line connection possible. A PLAN for a high-speed metro rail line that would take just 34 minutes to reach Badgerys Creek Airport from the CBD will be considered by the NSW and federal governments as part of long-term rail options for the west. The $8 billion project, which would be funded largely by a private consortium, would also offer a 18-minute rapid transport link between the city and Parramatta, and link the major economic zones of Sydney. Beginning at a new Metro station at Central, the Metro West Link would link the CBD with Barangaroo, the Darling Harbour centre, the Bays precinct and Strathfield and Olympic Park with Strathfield, Camellia, Parramatta and Westmead. It could work, depends on the details. Precedents already exist. The Arlanda Express runs non stop between Stockholm and Arlanda in 20 minutes. The train departs from Stockholm's Central Station, where you can also buy tickets either at a staffed counter or at the self-service machines. If you are travelling from Arlanda to Stockholm, you buy your tickets at the airport's information desks or in the Arlanda Express self-service machines located next to the escalators/lifts leading down. There are escalators/lifts down to the train from all terminals. You can travel at no cost between Terminals 2/3 and 5 with Arlanda Express – the trip takes only one minute. Communities will have a leading voice in the makeup of future Western Sydney rail links following the release of a discussion paper today by the Commonwealth and New South Wales governments. Rail service options outlined in the paper are designed to connect the key areas of a growing Western Sydney, including the Western Sydney Airport site at Badgerys Creek. A wide range of views has been expressed to date about whether there should be a rail connection to Western Sydney Airport, when it should be built, what the right route is and how it should be funded and financed. Among other proposals, there have been calls for an express train running east west between Western Sydney Airport and the Sydney CBD, as well as for a suburban train running north south from Campbelltown to Rouse Hill via Western Sydney Airport. This discussion paper seeks to lay out the full range of possible routes and seek comment from the community with a view to assisting in the decision making process of choosing which route makes the most sense. Planning and investing in the infrastructure needs of western Sydney is a key part of our plan to support economic development, create new jobs, improve access to jobs, and more affordable housing to improve the liveability of Western Sydney. The Western Sydney Airport and rail line will be key elements of the Western Sydney City Deal, presenting an unprecedented opportunity to link transport planning with long term urban planning and land use, given much of the area surrounding the site is presently greenfields and the airport will not open until the mid-2020s. From day one of operation, the proposed Western Sydney Airport will be serviced by world-class transport connections, with the right infrastructure in place at the right time. Work is already underway on a $3.6 billion package of road upgrades to connect the airport site to Sydney’s road network. Both governments will use the community consultation process to seek innovative financing models for the rail network. There are already examples of such models in NSW—such as WestConnex and NorthConnex and Parramatta Light Rail. The NSW Government’s metropolitan strategy, A Plan for Growing Sydney, highlights the need to create 760,000 more jobs across Sydney – with half located in Western Sydney. The new airport is expected to generate 60,000 such jobs. Road works already underway are generating around 4,000 local jobs alone. The consultation period opened today and will close on 28 October 2016. The final report, which will include a shortlist of preferred rail service options, will be considered by both the Australian and New South Wales governments in early 2017. You can have your say on the Western Sydney Rail Needs Study Discussion Paper at www.westernsydneyrail.transport.nsw.gov.au. They aren't mucking around in the Premier State. Victoria is not dawdling either. Meanwhile ... we meander along with lots of hope in banana-land hey? I welcome Infrastructure Australia’s announcement today of its assessment of the Western Sydney Airport Business Case, finding that a Western Sydney Airport would deliver net benefits to the Australian economy. Infrastructure Australia’s independent analysis demonstrates that the Western Sydney Airport Business Case is robust and confirms that the project provides net positive long-term benefits for Western Sydney, NSW and the nation. The Business Case finding is that the project would deliver in excess of $11 billion to the national economy. With an expected benefit cost ratio of 1.9, a Western Sydney Airport could deliver real benefits to the Western Sydney community and its economy. It will create jobs, encourage investment and be a source of economic growth for decades to come. Infrastructure Australia’s assessment of the Business Case is yet another important step towards making a Western Sydney Airport a reality. Airport business cases are rare globally and this represents a major project milestone. Construction is expected to commence in 2018, with operations beginning in the mid-2020s. The business case estimates the cost of the Stage 1 development at around $5 billion. Before earthworks begin, work will continue to be undertaken to prepare the site and ensure meticulous implementation of the strict environmental conditions ahead of any development, including heritage management activities, biodiversity offsets and the $10 million seed collection program. A summary of the business case will be available on the Western Sydney Airport website, www.westernsydneyairport.gov.au. I could not find the "summary of the business case" on the website AND I don't think "the summary" should be released, but the whole thing. If something is "summarised" then the whole original exists somewhere also? The benefit-cost ratio only tells you how efficient a project is. Ratios are dimensionless, so the project could be $1 and have $2 benefit versus a project with $1 billion cost and $2 billion benefits. The NPV is far more interesting as it describes how effective a project is. Lol was wondering when we'd see the BCR versus NPV post. AUSTRALIA: A consortium led by SNC-Lavalin Rail & Transit and including Aquenta, Architectus, Norman Disney & Young, SMEC and Stacey Agnew has been selected to undertake the Rail Feasibility Design study which will provide detailed costings and timescales for the proposed rail link to the future Western Sydney Airport at Badgerys Creek. The consortium will consider several alignment and station options. It will work closely with Transport for New South Wales and the federal government, which has allocated A$26m in its 2016-17 budget towards planning the future airport rail service. The study is expected to be submitted to the federal government in the first half of 2017. This will follow the Joint Scoping Study of Rail Needs for Western Sydney, which is currently underway and will provide advice on the timing, potential routes and type of rail services required. LABOR has promised $400 million to build several rail links connecting Sydney suburbs with the state’s new second major airport at Badgerys Creek. Opposition Leader Bill Shorten will announce the commitment on Wednesday, saying the infrastructure was critical to encouraging jobs and growth in Sydney’s west. The policy ­announcement from Mr Shorten, two years out from the next federal poll, comes after Labor has outperformed the Turnbull Government in 11 consecutive Newspolls. Mr Shorten said he wants the new rail line to be ready on the same day Badgerys Creek airport opens in 2026. “A rail connection from day one is critical,” he said. In the first phase of the rail line project, Labor plans to ­extend Sydney’s South-West rail link from Leppington via Bringelly to the new airport and will build a new outer orbital train line connecting the airport to Macarthur in the south and St Marys in the north. It then would look at building an outer orbital rail link connecting St Marys to the Sydney Metro Northwest at Rouse Hill, which will open in 2019. Working with the NSW Government, Labor would commit to an ­initial Federal contribution of $400 million. The project would need approval from Infrastructure Australia and will rely on additional funding from the NSW Government. Overall, construction of the Badgerys Creek airport and the new rail line would create more than 43,000 direct jobs and support up to 98,000 jobs in Western Sydney. Mr Shorten said new services were needed in Western Sydney, even without the airport, given it is now home to two million people — more residents than Adelaide. And Labor plans to ensure 10 per cent of workers involved in the construction of the airport are apprentices — with a significant proportion drawn from Western Sydney. Labor’s Infrastructure spokesman Anthony Albanese was the first federal politician to support building the second airport at Badgerys Creek Creek. Yet he has faced opposition from within his own party, with Labor MPs Ed Husic and Emma Hussar expressing concern about the noise and traffic ­impact of the airport. “The Government should be announcing rail funding in the budget,” Mr Albanese said last night. The Sydney Airport Corporation is currently considering whether to take up its right to build and operate Sydney’s second airport. If it declines, the Federal Government stands ready to provide up to $6 billion to build it. The Turnbull government has committed to building Sydney’s second airport. It made the decision after Sydney Airport Group, the owner of Sydney airport, declined the government’s offer to build the new airport at Badgerys Creek in the western suburbs. Sydney Airport Group told the stock exchange on Tuesday it had formally passed up the opportunity. It had obtained right of first refusal to build the airport in negotiations with the Howard government in 2002. “Sydney airport’s decision not to accept the [western Sydney airport notice of intention] on the terms provided is in the best interests of our investors who represent millions of Australians through their superannuation funds,” Sydney airport’s chief executive, Kerrie Mather, said in a statement. Malcolm Turnbull said the commonwealth government would now build the airport, with details to be announced in next week’s budget. Labor said in February it would support the government if it decided to build the airport itself. “The airport will be a major catalyst for jobs and economic growth in western Sydney, injecting more than $1.9bn into the economy during the construction phase alone,” Turnbull said on Tuesday. “It is expected to deliver 9,000 new jobs to western Sydney by the early 2030s, and 60,000 in the long-term. “It is a vitally important project for western Sydney, for Sydney, and the nation, which is why the Coalition government ended decades of indecision by committing to the project in 2014. “The government has worked carefully to meet our obligations and we have been planning for either contingency – acceptance or rejection by Sydney Airport Group,” he said. But Mathers said the terms of the right of first refusal provided Sydney airport with up to three months to review the “material terms” upon which the commonwealth government elected to develop and operate WSA itself. If the terms were more favourable, Sydney airport would have the option to develop and operate the airport on those terms, she said. 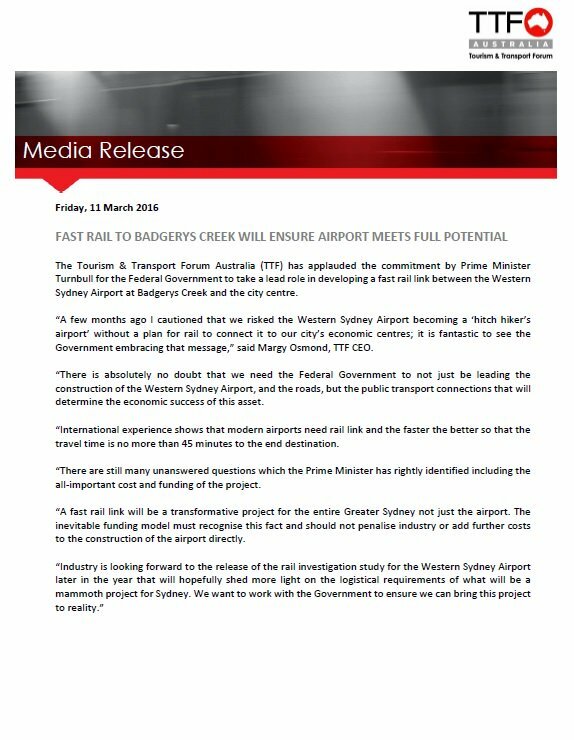 The government had put pressure on the company to make a decision on the airport at Badgerys Creek. The federal urban infrastructure minister, Paul Fletcher, warned in December that the government had “no intention” of letting negotiations drag out. Anthony Albanese, the shadow infrastructure spokesman, has previously said the Turnbull government could form a company to build the airport and later sell the company to a private operator. “This model is similar to that which is being used to deliver the Moorebank intermodal project established by the former Labor government,” he said in February. Rod Sims, the chairman of the Australian Competition and Consumer Commission, said late last year it would make sense for the government to build the airport itself, before selling it at a later date. The Blue Mountains mayor, Mark Greenhill, has blasted the government’s decision to build the airport, saying it was a desperate effort to showcase a short-term economic win at the cost of a long-term social and economic disaster. “Sydney Airport Corporation’s decision not to accept the Australian government’s offer to build and operate the western Sydney airport vindicates the community opposition to this white elephant project that is decades in the making,” he said on Tuesday. The very notion of having the owner of Sydney's Kingsford Smith airport, Sydney Airport, build and operate the city's second airport at Badgerys Creek is akin to putting the turkey in charge of Thanksgiving. In corporate terms, it's the equivalent of asking Telstra to build a competitive phone network, BHP to build a competitive iron ore company or the National Australia Bank to open a fifth banking pillar. Crazy. The Federal government will announce in the budget how much it'll allocate to building the airport in Badgerys Creek after Sydney Airport Group chose not to build and operate it. While the government was obligated to allow Sydney Airport first bite of the cherry on building and operating a competitive new airport, thanks to an agreement struck 15 years ago, the reality is that this is an infrastructure asset that only a government can invest in. Sydney Airport doesn't want competition. It is in its interests to institute a go-slow on introducing a new player into a market in which it has a monopoly. It is not in Sydney Airport's interests to subject its investors to a long-term and expensive project that is more than a decade away from making a return. It will cost $6 billion to construct an airport and that's without taking into account the cost of financing. Add to that the fact that it won't become operational for another 10 years. Turning a profit will take longer again. Thus it's not surprising that Sydney Airport declared on Tuesday that from a commercial perspective it's a no-fly zone. Committing billions to a project that will ultimately cannibalise its own earnings would border on the financially insane for Sydney Airport. But the strategy ticks plenty of boxes for the federal government. Sydney has been talking about a second airport for 30 years and for most of that time it hasn't been the compelling argument that it is today. t is an investment in the future of tourism – which is one of Australia's biggest growth sectors. Add to that the reality that in next 10 years Sydney Airport will run out of capacity to accommodate an increase in air traffic. One need look no further than Sydney Airport's investor presentation on Tuesday in which it said traffic in the March quarter moved up 5.7 per cent. Inboard tourism is booming. Federal Treasurer Scott Morrison will enlighten us with more detail in next week's budget but suffice to say this is now to become one of those infrastructure projects that requires "good debt" so it's a less painful budget impost – given that at some stage, maybe in 15 years it can be sold via an asset privatisation. Unlike the NBN – the government's biggest infrastructure investment over the past decade – a new airport is not particularly complex. Pricing the build is not that hard, and technology will not play a significant role in moving the goal posts over time – there are certainly fewer moving parts. It is an investment in the future of tourism - which is one of Australia's biggest growth sectors. And unlike the second airport in Melbourne at Avalon, there should be demand for a second Sydney airport that is not in a paddock miles away from anywhere. Planning for a rail line through Badgerys Creek airport is emerging as the focus of tension between federal and state governments over land use and transport policy in Sydney. NSW Transport and Infrastructure Minister Andrew Constance is increasingly pushing back against federal input into the policy area, declaring that Canberra's plans for Sydney should not detract from the state's aggressive agenda. "I'm a bit sensitive to Canberra suggesting that they can do it better," said Mr Constance. "I just think we don't want to duplicate functions of government," he said. "We are happy to work very closely with Canberra, that's what we are doing. "But I'm very sensitive to the fact that the expertise resides within Transport for NSW, some of our project teams, the private sector here, coupled with Infrastructure NSW. I'd like to see real money from Canberra invested into our projects." The friction between the two tiers of government emerged after the federal budget, in which Treasurer Scott Morrison committed to establishing a federal team to work on attracting private finance into transport projects. Describing that policy, federal Assistant Minister for Cities Angus Taylor said Canberra could "no longer be an ATM to the states". "We must have a greater say in how taxpayer dollars are invested in big infrastructure projects, so that we can secure better outcomes for the community," Mr Taylor said. These comments, however, aggrieved Mr Constance. Through projects such as inner city light rail, Parramatta light rail, and the metro rail link from Sydney's north west and through the city, Mr Constance is in charge of some of the biggest transport initiatives in the country's history. "We don't appreciate the comments of Angus Taylor," said Mr Constance. "We don't want an uncapped line of credit. We need real money, we've got the expertise, as demonstrated in NSW at this time where we've got one of the most ambitious programs in the globe." One emerging area of difference between the two governments is the planning around a Badgerys Creek airport. The two are working on a study into how an airport rail line would work, but Mr Constance said his government's priority was more metro rail lines across Sydney. The indications from the federal government are that it is pushing for a rail line to run north-south through Badgerys Creek airport, possibly to join with the Western Line at St Marys. But this line would only put more pressure on the already overcrowded Western Line, a rail corridor Mr Constance says will soon be unable to carry more passengers. "By 2031, with the T1 Western Line, you quite literally won't be able to get people on trains in the morning peak," Mr Constance said. "So if you feed into the Western Line airport commuters and any growth along that corridor, you're going to end up in strife," he said. The state government's long-term solution to the problem of the Western Line is a new metro projects to run between Parramatta and the central city. Mr Constance announced the West Metro line last year, with an intention for it to be running by the middle of next decade. "Ultimately we've got to be very careful that whilst Canberra is pushing hard in relation to the best rail option, and we will see the scoping study results in the next few months, that airport line is very much about giving western Sydney commuters a service to the airport and that corridor – but we've got to be very sensitive to the impact on our existing rail network," Mr Constance said. Mr Taylor said: "The Prime Minister has resolved to bring skills in-house, into his own portfolio, to find better ways to invest and deliver quality infrastructure sooner. "Australians are not served by a federal government that takes a passive approach to infrastructure investment." PRIME Minister Malcolm Turnbull has asked the Infrastructure Department whether there can be a rail link to Western Sydney Airport by the time it opens – or if not, how soon afterwards. “The Australian and NSW Governments have worked on a scoping study to look at the rail needs of western Sydney and Western Sydney Airport,” an Infrastructure Department spokesman said. “The Australian Government is taking steps to safeguard space for future stations and preserve a rail corridor to the site,” he said. However, local MPs say the government is still off track when it comes to plans for passenger rail to and from the planned Western Sydney Airport. The Badgerys Creek site for Sydney’s second airport is surrounded by major road but MPs and residents have repeatedly called for public transport connections to open when the airport does. Werriwa federal Labor MP Anne Stanley said infrastructure minister Paul Fletcher was unable to commit to a train line in Question Time last week. “He still refuses to do this,” Ms Stanley said. The Infrastructure Department spokesman said the scoping study from 2016 explored a range of rail routes that would connect the airport to the broader western Sydney region. “The scoping study has reported to the two governments, and there will be more to say in the coming months,” he said. Ms Stanley said federal Labor had committed to extending the South West Rail Link from Leppington via Bringelly to the new airport. Labor federal infrastructure and transport spokesman Anthony Albanese also reinstated his support of the rail link last week. “If done properly, the Western Sydney Airport could bring great investment and opportunity to the people of western Sydney,” Ms Stanley said. Ms Stanley said passenger rail needed to connect the airport to the existing rail system before it was open to the public. CONSTRUCTION on the $5.3 billion Western Sydney Airport will begin almost immediately­, creating hundreds of new jobs. The first major contracts for work on the sprawling Badgerys Creek project have been awarded to Australia’s two largest building companies, Lendlease and CIMIC. The Saturday Telegraph can also reveal that Bechtel — the US company which designed and built expansions at Dubai and Hong Kong airports, and which is currently working on London’s Gatwick Airport — will be brought in to manage­ the entire construction project. The contracts, to be announced­ today by Cities Minister Paul Fletcher, are understood to be worth about $330 million and will create at least 300 jobs. Bulldozers will begin to flatten the area and construct new roads before major construction begins next year under the deal struck by Lendlease and the CIMIC-owned CPB Contractors. When Western Sydney Airport opens in 2026, it will have already supported 11,000 jobs during construction and will be able to handle 10 million passengers in its first year alone. Mr Fletcher said that work was finally getting underway on one of the country’s largest infrastructure projects after it had been “talked about for a decade”. “Western Sydney Airport will transform Western Sydney­, creating thousands of jobs and encouraging economic growth and investment in the region,” he­ said. Assistant Finance Minister David Coleman said the airport would drive a jobs boom in Western Sydney, with billions of dollars of other construction planned to support the new facility. “It’s great to see that starting now, generating more local jobs, even at this early stage in the project,” Mr Coleman said. The state and federal governments­ are expected to invest­ about $3.6 billion in upgrading and building new roads around the airport, while another $7 billion has been set aside to connect Badgerys Creek to Sydney’s rail network at St Marys. The government-owned Western Sydney Airport Corporation­ was established last year after the Turnbull government decided to go ahead with the project after Sydney Airport Corporation, which had first rights to build the new facility, walked away from the deal. Construction on Western Sydney Airport will begin this week, with the first sod turned by Prime Minister Scott Morrison. The project aims to create more jobs for the region and provide infrastructure that will help strengthen the economy. When it opens, the airport aims to cater for up to 10 million passengers, with a gradual expansion to two runways will eventually cater for up to 82 million passengers, the size of London Heathrow and JFK in New York. Western Sydney Airport has called for expressions of interest for the first of three major earthworks and airside civil works packages, expected to be awarded in mid-2019. Mr Morrison said the Western Sydney Airport will provide a gateway to the world, not just for people but for job-producing freight as well. “For half a century Sydneysiders have talked about a second airport. By tomorrow, bulldozers will be moving and work on the Western Sydney Airport will be underway,” Mr Morrison said. Minister for Finance and the Public Service Mathias Cormann said the Federal Government’s investment of up to $5.3 billion in equity in Western Sydney Airport will have long-term economic returns. “The airport will be at the centre of the Western Sydney Aerotropolis, which will be a global hub of innovation for sectors including defence and aerospace, freight and logistics, agribusiness, pharmaceutical and biotech industries,” Mr Cormann said. Minister for Cities, Urban Infrastructure and Population Alan Tudge said the project is about bringing jobs, education, industry and innovation for a prosperous and sustainable future for Western Sydney. “The airport is already driving further investment in the region, including billions of dollars of Federal and NSW Government investment in road and rail connections, including the M12 motorway and North-South Rail Link,” Mr Tudge said. Initial earthworks are due to be completed by the end of 2019. Hopefully the Metro West from the CBD to Airport via Parramatta (or something along those lines) will be operational for the first day of operation.